We were camping with friends, another family of four. After we children spotted craft while fishing, we ran and told our parents about it. Bob and his family reacted like any normal humans. They sped in their car toward the upper end of the lake, in pursuit of the craft, while my mother decided it might be dangerous and we should stay at the campground. I didn’t feel that threatened and wondered why she thought it might be dangerous. It’s interesting to note that this campsite became a favorite my folks later visited annually, especially on their anniversaries. Even though they couldn’t remember any encounters, they seemed to be enchanted with the place. On still evenings, as one stood under the draping branches of huge cottonwood trees, the surface of the lake mirrored the mystical dark forms of a few small trees against the beautiful summer sunsets. At the time of this experience, Bob and his family had either not yet moved to Chadron State Park, which was located in western Nebraska, or they had just moved and were visiting us in eastern Nebraska. Bob’s father, a park superintendent, worked for my father. Standing around, not knowing what to expect, we witnessed a flight of large objects directly overhead. The way in which they flew seemed strange, like those I had seen on other occasions, but I didn’t fully understand it at the time. They went out of view behind a hill and trees several yards away. We soon convinced my mother that we should follow them. Investigating in our car, we experienced some direct contact with a large windowed saucer that sat on the ground on the other side of the lake. I noticed that an unseen source located above the saucer illuminated it brilliantly. Suddenly, I received an audible communication as we sat in our car, not more than 70 feet away from it. All five of us heard the message, but I don’t recall what the voice said. My mother finally insisted that we leave the area. Encountering another object back on the other side of the lake, I felt an intense inner urging. It seemed as if someone I couldn’t see talked to me. I could almost detect the message in perfect English, while at the same time feel it in my body and soul. The message told me to get out of the car and go to the craft. Like the Bethany Grade School encounter, it soon became a strong, irresistible inner urging. I opened the door and started for the craft, while my folks frantically tried to call me back. My mother must have felt something from previous encounters; she seemed to understand what might be happening and that I couldn’t resist the inner urging. She convinced my father to get out and hold me. He finally convinced me I should re-enter the car. We also encountered an object in an open field higher up on the hill, saw still another flight of large objects fly over us on a road nearer the campsite, and then returned to the campsite. We either experienced a time-loss episode at this point or the disc simply disappeared. Still standing there, expecting most anything to happen at any time, we were shocked to see a very large booth (door, windows, and all) hovering over the center of the lake. It hovered about 100 feet up in the air and was being illuminated by an unseen source. We all got petrified as Bob’s father began yelling from inside of it. None of us understood how he had gotten there. As the large booth hovered motionless above us, a pure blue beam of light descended, at moderate speed, into the water in front of us. The beam of light then retracted. My father got very concerned about Bob’s father. Suddenly, my father somehow knew he had to wade out into to the lake in order to help. He took off his shoes and waded out about 40 feet in front of us. The blue beam again descended. When it hit my father, he mysteriously disappeared! My mother frantically herded my two sisters and I into the car. We sped away, as fast as she felt safe, around the bay. Arriving at the other side, the car mysteriously stopped and we all sat there, confused and frightened. My mother said she was trying to save us from what ever danger might lie in store. However, we remained stuck, forced to watch the illuminated booth from another vantage point. Its interior appeared particularly illuminated. It is difficult to express how strange it was to see a bizarre rectangular box-like booth hovering in the air above the water. We couldn’t make sense of it, but there it floated just as natural as the trees around us. It wasn’t the exact same booth I saw during the normal saucer/booth routine, however. It appeared larger and had two metallic, horizontally elongated inverted cones at its bottom. The booth-like cabin was built into the upper cone, and there seemed to be rounded, horizontal parallel ribs on the surface of the bottom cone. The ribs were very similar to the bell. Instead of the ends being flat like the small booth, they were rounded. My mother eventually tried to start the engine again and it started. She then faced the decision of again putting us in harm’s way, by going back to see if we could save my dad, or leaving the lake. It didn’t take long for my sisters and I to convince her we had to go back. 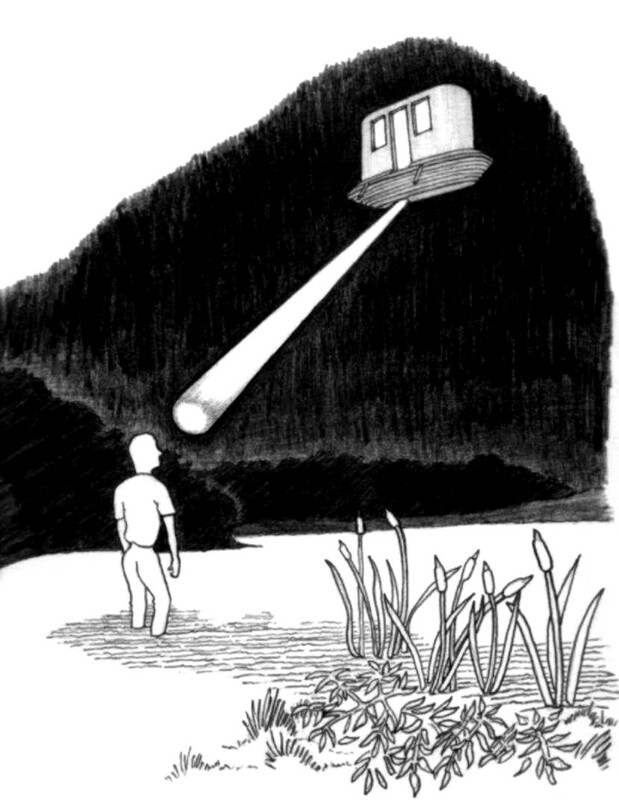 Slowly driving back toward the campsite, we saw the dark form of the booth still ominously hovering above the lake. As we got out of the car, my father came wading out of the lake, as if he had just appeared from nowhere. We children were very excited throughout the entire ordeal, but my father and mother seemed somewhat confused about what had just happened. Discussing the situation for a short time, they apparently decided they would protect us; they instructed us to forget all that had taken place, then immediately sent us to bed. We could no longer see the booth. We didn’t see Bob’s family until the next morning and, as I remember, we all had forgotten the entire affair. I am a 80 year old retired research and development electro/mechanical engineer with experience in the nuclear, aerospace, fluidic, civil and commercial fields...home builder, general contractor, artist, lecturer, author. Up until 1986, at age 48, I could recall some strange things that had occurred from my very early childhood...but I really couldn't understand them. Then in late 1986 through early 1987, in a very short time, I recalled, in extreme detail, an enormous number of so-called UFO encounters that had occurred throughout my life. Needless to say, I became almost totally devastated; my entire life was turned up-side down. A few witnesses have since recalled some of what I recalled, enough to convince me and them I am not psychotic or imaginative. In other words, believe it or not these unbelievable things actually happened. I have spent the last 30 years researching, writing and trying to understand. As a result of my intense efforts, I now can offer you three books and a website (http://www.johnfosterufos.com) to help you and humankind try to understand some of the hidden mysteries of life and UFOs. The mysterious intelligences connected to my encounters have told me that they are "the monitors and Keepers of the earth" and are responsible to a hierarchy that includes "the arch angels Michael and Gabriel," who are responsible to the entity we have know as "Christ," who is in charge of this corner of our immense complex universe. They explained further that they are not allowed to interfere in the affairs of humankind except at certain times, when things are going awry or are dangerous. They said this is one of those times, one of those eras. They continued to state that if they hadn't interfered in the past, we would have destroyed ourselves...and that if they don't interfere now and in the future, we will indeed destroy ourselves. Strictly for your own benefit, take a look at the information here on http://www.johnfosterufos.com and read the books I've written in order to understand in some detail what this is all about. The website and books can give you insight into how so-called UFO encounters have affected our sciences, religions, and history...and how they most likely will affect our future.